Photographing your staged home for online real estate viewing is one of the most important steps in attracting buyer interest when you are selling your home. Online real estate photographs are the first thing that buyers look at when they search for a new home-- over 90% to be precise. It's to your advantage to take some amazing pictures of your home to post online. 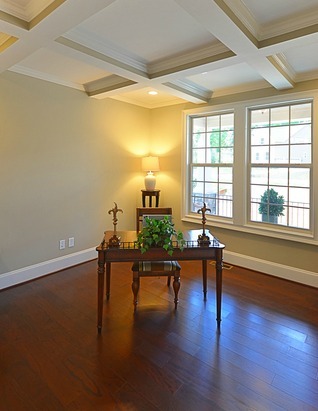 See the six must-have online real estate photos! A recent survey found that 86% of home buyers felt that online real estate pictures were the most important and useful feature of their search. Additionally, most buyers said they skipped right past listings that didn't have real estate photograpy to view. If you want to make a fast home sale, you must include visual elements of it online! This page doesn't deal with which camera to use or camera settings, but rather with guidelines that will help you set up the perfect shot for your online real estate photos. The only thing you need is a good camera capable of producing high-resolution photographs. Read on to learn how to take beautiful pictures of your newly staged home-- pictures that give you a faster home sale by making it stand out from the rest of the competition. This page contains information for taking pictures of ALREADY STAGED homes. If your house isn't ready, go to declutter your home for some diy home staging. Make sure that your home is picture perfect before you start taking photographs. 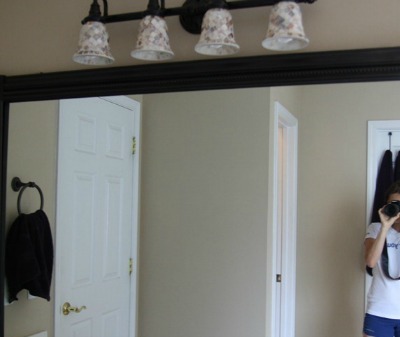 Scroll through other online real estate listing photos; take note of why some photos look better (or worse!) than others. Imitate those you think will work well for your home. ﻿Make sure your property shows well before presenting your photos to the public. Take sample pictures and view them on your computer or smartphone to get a buyer’s perspective. Ask a friend for their opinion. When photographing your staged home, create a lifestyle that home buyers are looking for; dress up your indoor and outdoor areas. Browse through interior design pictures in magazines for ideas. Hang a hammock or place a porch swing outside, set up an outdoor table next to a built-in barbecue, create a spa-like bathroom...make your home look like a place where people have fun. See curb appeal for outside home staging ideas. For diy tips on photographing your home exterior and outdoor spaces, see six must-have online real estate photos. Use a tripod or other flat surface to avoid blurring your photos. It may seem logical to shoot straight at a wall, but the result can often make a room seem flat and the walls appear to bend. A common mistake is trying to photograph an entire room in one shot, unless the room is really small. Capturing three walls can create a boxed-in effect. In general, no more than half of a room should be visible in a shot. This means that only two walls and parts of the ceiling and floor will be in the frame. I once left a bottle of windex sitting on the windowsill of a home I had staged. I didn’t notice it until later when it was too late for a do-over! Always be aware of clutter and other distracting details-- clear them away before snapping your pictures. If an object “jumps” out at you in a photograph, remove it and retake the picture. 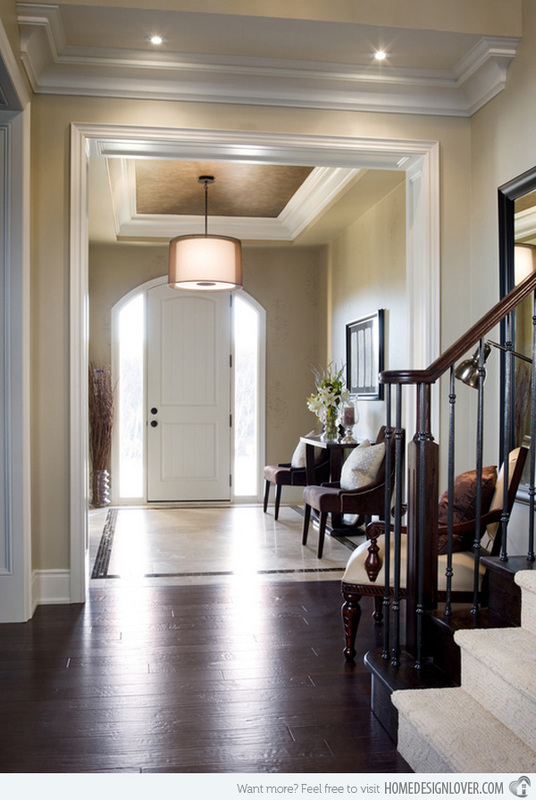 The point of staging is to simplify and get rid of anything that distracts from your home's best features! Take pictures from a corner of a room. This will emphasize the square footage of a space. A tip for getting a great interior photo is to highlight a room’s dimensions. 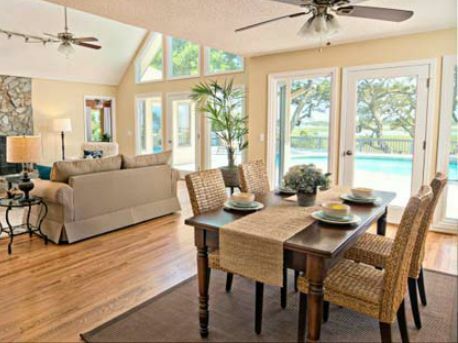 When photographing your staged home interior, take pictures at an angle, from the corner of a room. This will emphasize the square footage of the space. Home exterior photos should be taken at an angle, not straight on. This will show off the depth of your home. Don’t use an ultra-wide angle-lens that will distort the size of the room. Trying to make your home look bigger then it is will only anger buyers when they see it in person. Avoid placing subjects dead center in the frame of your photograph--too boring! Instead, mentally divide the frame into thirds and place your subject along one of those lines. This is called "the rule of thirds." Placing your subject off-center makes a more interesting composition. See art of accessorizing for diy tips on arranging accessories. Consider perspective when photographing your staged home. As the photographer, you not only get to choose your subject, you decide how viewers will see it. The angle in which you hold your camera effects the way the subject appears to the viewer. For instance, vertical lines can look crooked, instead of straight if you tilt the camera up or down. To avoid "perspective distortion," keep the camera angle vertical, straight, and level. Shooting from standing height can cause perspective distortion as well. Squat down or use your legs like a tripod. Be aware of the size of your subject inside the frame. Large objects will appear closer to the viewer and will seem more prominent in importance. When highlighting a particular feature or object, make sure it's framed close enough so that it doesn't compete with other objects in the room. Take as many pictures as you can. The more photographs you take, the more beautiful pictures you’ll have to select from. Zoom in and out. Experiment. You will be amazed at how different your space will look from different vantage points. When taking interior pictures, try to do it using only natural light and on a sunny day. Open up all the draperies and window shades. The best picture taking light occurs in early morning (30 minutes after sunrise) and late afternoon (one hour before sunset) when the light is softer. A well-lit interior is essential when photographing your staged home, so turn on all the lights if natural lighting isn't enough. Avoid using a flash, if possible. A flash often creates a hard light, shadows, or an eerie quality. It will also reflect off windows and mirrors. The feature wall in your photograph should be well lit. If lighting is insufficient, bring in a floor lamp and point it toward the subject wall. When photographing your staged home, make sure the light is behind you when you snap your pictures. 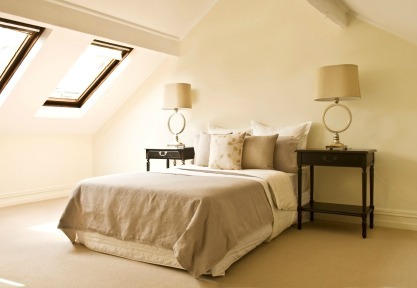 Bring in an extra floor or table lamp to fill dark corner spaces. Your goal is to balance the light so that there are no over-lit or under-lit spots in the shot. Be aware of glare from windows, mirrors, and shiny objects in the room. Don't aim your light source directly at mirrors or windows-- the reflection will produce a harsh glare. Don't point your camera directly toward a light source. This can produce shadows that will muddle most of your image. A soft light is most desirable for shooting photographs, so try taking your pictures in early morning or late afternoon. Make good use of the light that is available in the room. Play with the shades, open the window treatments... experiment. If you’re relying on natural light alone, the best time to shoot depends on the placement and size of windows. 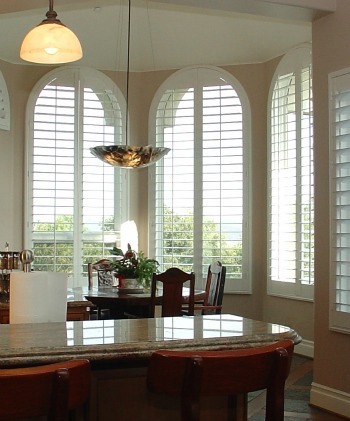 If too much light is coming in from the windows, close the drapes or window shades. Never photograph straight into the light. Bright light in the background is better than indoor lighting. You may want to experiment at different times of the day to see which lighting you prefer. A general rule of thumb when photographing your staged home, is that eastside rooms should be taken in the morning, and westside in the afternoon. Rooms with northern and southern exposure should be taken when the rooms are at their brightest. Don't shoot on a rainy, dreary day. This will make your home appear dismal and uninviting. Avoid shooting pictures when the sun is glaring in the windows. Sometimes you just have to wait for the right light. 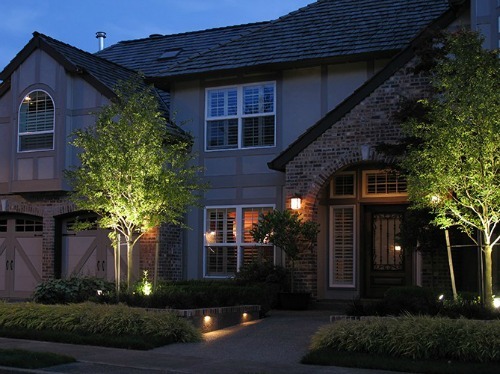 Home exterior night photos can be a charming addition to your online listing photos. Maybe you have appealing outdoor landscape lighting or a welcoming porch you’d like to highlight? Indoor pictures can be taken at night, but the results won't be as reliable. Turn on all the lights and use your flash. Experiment by moving extra lamps around to improve your shots. Home exterior shots taken on a bright sunny day make cast dark shadows on your home. Exterior shots often turn out better taken on overcast days. When you are ready to post your pictures online, start with the exterior shots of the front of the house, then go room to room, as if you are walking through the house. End with pictures of the back of the house and back yard. Post 20 to 30 photos for your online real estate listing. Don’t forget to use your picture editor to fix your less-than-perfect photographs, but don't over edit. Be sure to label each picture as well, so viewers don't have to guess which room they're looking at. Find out what the six most desired listing photos are at this time! Fluffing - This is a real estate term for exaggerating, by using descriptions to make a home sound better than it really is. This can be done with online real estate pictures as well. Fluffing, or fluffery, is done for the sole purpose of getting home buyers in the door. As a former realtor, I viewed it as a complete waste of time, because when buyers actually saw the house, they were so irritated, they couldn't view the home objectively! Fraud - Don’t photoshop too much. You could run into ethical issues if you falsely straighten up a deteriorating chimney, add wood flooring, or edit out a gravel pit next door. It’s acceptable to edit out things like your dog or a car in the driveway, or the garbage can you forgot to take in. Take care that you don't falsely misrepresent your house by making it took too good. Buyers will only be disappointed and walk away angry. Don't photograph a bathroom with a toilet seats up...EVER! Close the lids during viewings too. Don't put blurry pictures online! Blurred photos make me frustrated-- they're so unnecessary. Use a tripod or other flat surface to steady your shots and take the time to get it right. Don’t publish your photos upside down or sideways-- so unprofessional! Real estate agents do this all the time-- very annoying! Take the time to rotate the pictures properly. Don't make this mirror selfie faux pas! Don't take pictures of empty rooms. Empty rooms don’t leave an impression on online viewers. Add a piece of furniture; a desk and chair, a bed...something to give the viewer a sense of purpose, scale, and perspective. When home staging rooms, don't use shabby furniture. It should be tasteful and in keeping with the style of the home. That old moth-eaten sofa will only make the house appear forlorn and outdated. Invest in some slip-covers. Never leave a room out of an online gallery when photographing your staged home. People are always suspicious when a room is left out of the lineup. What are they hiding? Do your dishes! Sounds obvious, but I've seen many online real estate photographs featuring a sink full of dishes. Keep people and pets out of your pictures. Pets are hard on houses, especially flooring, and home buyers know this. Buyers don't want to see home sellers in pictures either. This makes it hard for buyers to see themselves living there. See depersonalizing your home. Really REALLY funny online real estate photos! I discovered this website, "Hooked on Houses," when I was looking for funny photographs. If you're in need of a good laugh, follow the link below to see the funniest, weirdest, and creepiest real estate photos ever! Be sure to read the commentary with each picture, because they're even funnier than the photos.